naturocrit: The Naturocrit Podcast Episode 013 Audible.com Version is Live! 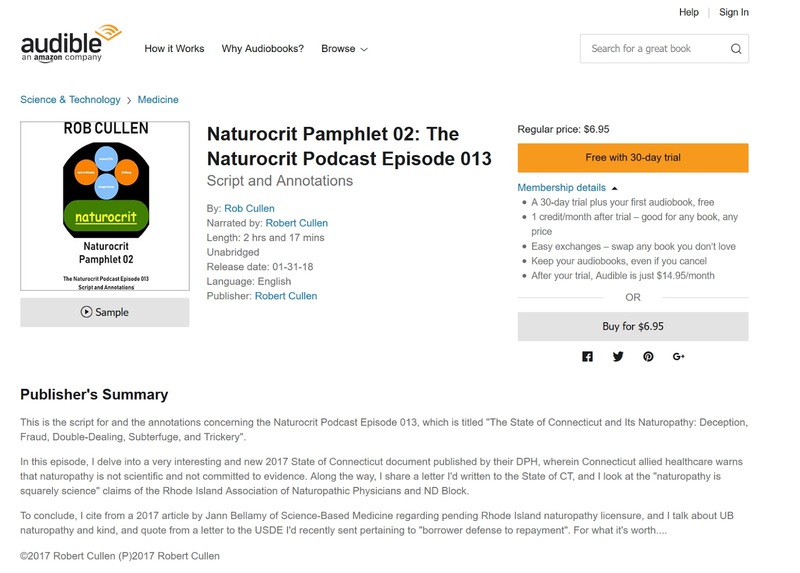 The Naturocrit Podcast Episode 013 Audible.com Version is Live! "This is the script for and the annotations concerning the Naturocrit Podcast Episode 013, which is titled 'The State of Connecticut and Its Naturopathy: Deception, Fraud, Double-Dealing, Subterfuge, and Trickery'. In this episode, I delve into a very interesting and new 2017 State of Connecticut document published by their DPH, wherein Connecticut allied healthcare warns that naturopathy is not scientific and not committed to evidence. Along the way, I share a letter I'd written to the State of CT, and I look at the 'naturopathy is squarely science' claims of the Rhode Island Association of Naturopathic Physicians and ND Block. To conclude, I cite from a 2017 article by Jann Bellamy of Science-Based Medicine regarding pending Rhode Island naturopathy licensure, and I talk about UB naturopathy and kind, and quote from a letter to the USDE I'd recently sent pertaining to 'borrower defense to repayment'. For what it's worth...."
now, the orginal PDF document was here [2017 archived], but ct.gov has, coincidentally, pulled that live link. Truly 'there is something rotten in Denmark' and they're such a 'parcel of rogues' but, 'this land is your land, this land is my land' so, I'll now also host that document myself here. it's been an interesting process: write a script and record a podcast, post the script, publish the script as a kind and paperback, then publish that paperback as an audiobook. More to come, surely. Slowly, and surely.